You know those days when your weekly lesson plans just aren’t going to happen? A child wakes you up by puking into your bed and you need to go to the doctor; your sweet husband might, for once in his life, have something he’s asked you to do and since he’s virtually ignored (ahem) you feel compelled to do it; or, like today at our house, it might be such a beautiful sunny day that you don’t see how you could possibly suffer doing school inside. I know discipline is important, I do, but sometimes I just have a hard time doing our boring old book lesson when the birds and the plum trees are singing to us. Usually we can be a bit flexible and still cover the material. One of my friends said once, “Oh, sure, easy for you to say. I have no idea how to do that!” Really? I thought everyone did this. But, other things come more naturally to her, things like, say, keeping a clean house or cooking dinner. To each her own. I thought I’d share sort of the thinking behind this particular day. And I’d like to know, how do you adapt the lessons at your house for sun or snow? Step One: What is the material we need to cover? 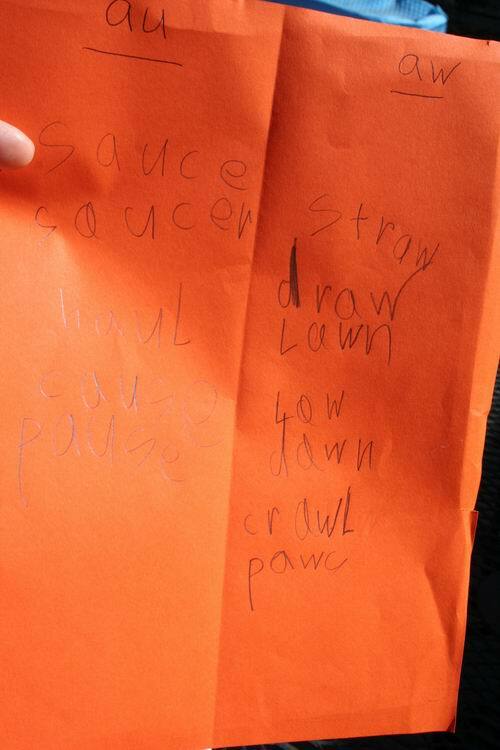 Today with my second-grader, it was a spelling test. Normally, we do one spelling word list per week (this is the A Beka Spelling and Poetry book), and a test on Thursday where he writes the words down. This lesson was a bit tricky— the difference between “au” words and “aw” words–so the orange sheet was a little extra practice at which words go in which column. Step Two: Where are we going to be? Outside. I wanted to do something outside. It was sunny and beautiful today. So, how could I teach the material outside? 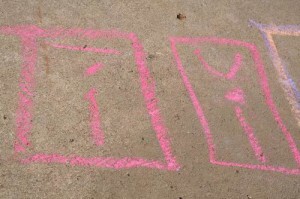 I decided to make chalk squares with the letters inside. 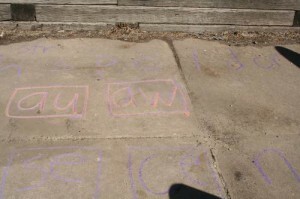 The idea was: I would call out the spelling word and my son would jump on each letter in turn. We started out with he and his five-year-old sister holding hands, but then of course the two-year-old wanted to join, and things got a bit tricky. So we switched to them taking turns. I called out a word, “Cause” and my second grader would jump on the letters to spell it out. Then, of course the other two were left out, which brings us to . . . Step 3: How can my other children be involved in something similar? 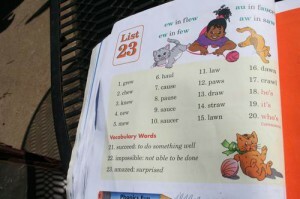 For my kindergartener’s turn, I called out a simpler word from the list, “Paws.” That was still a little too hard because of those tricky au/aw sounds. So we went to just letters. I’d say “Puh” and she would jump on “P,” then “ssss” and she would jump on “s.” Then, that was a bit too easy, so we made it a bit trickier by adding short/long vowel sounds. She’s been working on that lately. make the sound, which was great too. My two-year-old mostly ran around jumping on things. When I wanted to give him a turn, I said, “ssss for curvy curvy s!” and took him over to jump on it, and we all clapped and cheered while he beamed to the crowd. You’d think he just won an Oscar. Can I just point out our shoe style? We managed to get to library story time and back before any of us noticed my little buddy had on mismatched footwear. But at least he had them on, and he did it himself! 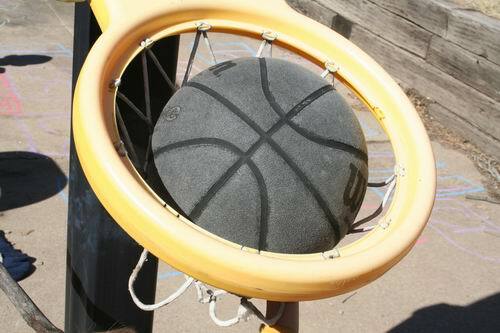 This is the other great thing about doing school outside—basketball. My little guy ran off to play basketball while the other two finished up their spelling/phonics lessons. Lovely. And, really, that’s school for him too, isn’t it? 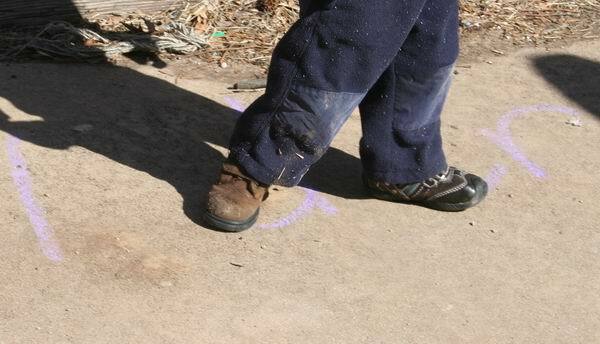 Large motor skills, eye/hand coordination. Perfect. eighths, etc. Approaching the same material in a new way really seems to help. spelling out words, and written letters with wet sponges instead of pencils. When we have to double up on lessons. This week for example. 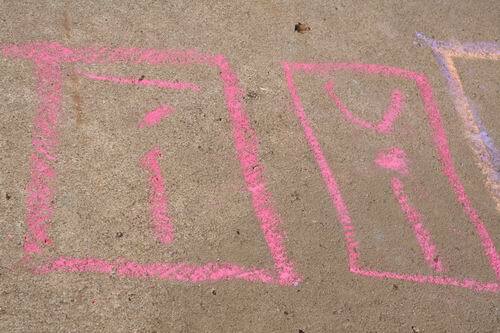 I have two spelling lists to cover this week, so by turning one test into hopscotch, I might, might have avoided a mutiny when I announce another spelling test in two days. Last fall we doubled up on math lessons (because we switched to Saxon and needed some extra lessons to get caught up to their way of doing things), but I tried to make one lesson into a game, or hands-on activity at dinner time. 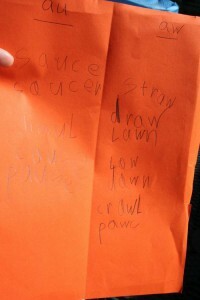 Anyway, this is one of the beautiful things about homeschooling, isn’t it? 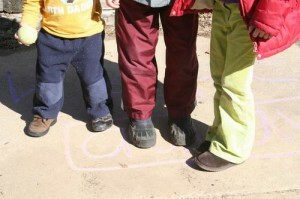 We can adapt lessons to fit our children, and enjoy the lovely spring weather as well! 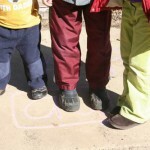 I’d love to know (once I tell people about this blog): How have you adapted lessons to fit your children or your day? This entry was posted in Homeschooling and tagged Homeschooling, life with little ones, outside time by Charity Hawkins. Bookmark the permalink.